O.M.G. Is anyone in the mood to shop for me? Does anyone have an extra $50,000 burning a hole in their pocket? 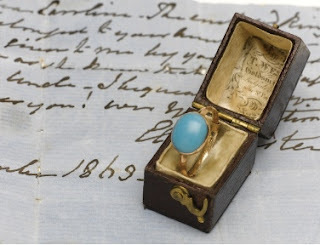 This ring, once belonging to Jane Austen, is going up for auction at Sothebys. I can almost envision this on my finger...sigh. $50,000 - if only! Thank you for visiting my blog http://marchhousebookscom.blogspot.co.uk/ earlier today. I like your blog very much – maybe we should follow each other with Google friend connect? I will if you will! Wow expensive! I do not know much about the value of Jewelry. I wonder, does that fact that it was once owned by Jane Austen make it more valuable and if so how much. I'm pretty sure that's the only value, that it once belonged to Jane Austen. It was passed down through her family. Boy would I love to get my hands on that! I'm a giant fan of hers, as are so many folks.